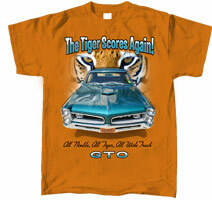 Pontiac GTO "The Tiger Scores Again!" Highly Detailed Small Logo of the script “GTO” below the front end of a 1966 Pontiac GTO on the front left hand side chest of this Tee. The script colours are a Turquoise and White, with Black Bold outline font. Traditionally known as the ‘Goat’, this fantastic brilliant artwork is one of the first Pontiac GTO generations released for ’66 by Pontiac, from the General Motors stable. The attention to detail of this 1966 Pontiac GTO hardtop is remarkable. From the accuracy of this unmistakable frontal grille and bumper assembly, to the hood scoop, through to the correctly scaled body and exterior panel trim. Check out those factory aggressive headlight assembly arrangements and that deep grille detail. Pontiac's intermediate line was restyled again for 1966, gaining more curvaceous styling with kicked-up rear fender lines for a coke bottle look, and a slightly "tunneled" backlight. The tail light featured a rare louvered cover, only seen on the GTO. Overall length grew only fractionally, to 206.4 inches, still on a 115 inch wheelbase, while width expanded to 74.4 inches. Rear track increased one inch . Overall weight remained about the same. The GTO became a separate model series, rather than an optional performance package, with unique grille and tail lights, available as a pillared sports coupe, a hardtop sans pillars, or a convertible. Also an automotive industry first, plastic front grilles replaced the pot metal and aluminium versions seen on earlier years. New Strato bucket seats were introduced with higher and thinner seat backs and contoured cushions for added comfort and adjustable headrests were introduced as a new option The instrument panel was redesigned and more integrated than in previous years with the ignition switch moved from the far left of the dash to the right of the steering wheel. Four pod instruments continued, and the GTO's dash was highlighted by walnut veneer trim. The background of the Tee is aggressive with the image of the face of the ‘Tiger’, signalling the era of the “GTO Tiger” for ’66. The scripts “The Tiger Scores Again, All Nimble, All Tiger, All wide Track” are clearly presented above and below the main featured artwork. Tee shirt Colour: Available in Burnt Orange only with Genuine GM Official merchandise Tags.